River water quality in rapidly urbanising Asian cities threatens to damage the resource base on which human health, economic growth and poverty reduction all depend. Dhaka reflects the challenges and opportunities for balancing these dynamic and complex trade-offs which goals can be achieved through effective policy interventions. There is a serious problem of water pollution in central Dhaka, in the Turag-Tongi-Balu River system in Bangladesh with the river system being one of the most polluted in the world at the moment. A baseline survey of water chemistry and total coliforms has been undertaken and shows dissolved oxygen close to zero in the dry season, high organic loading together with extreme levels of Ammonium-N and total coliform in the water. Models have been applied to assess hydrochemical processes in the river and evaluate alternative strategies for policy and the management of the pollution issues. In particular models of flow, Nitrate-N, Ammonium-N and indicator bacteria (total coliforms) are applied to simulate water quality in the river system. Various scenarios are explored to clean up the river system, including flow augmentation and improved effluent treatment. 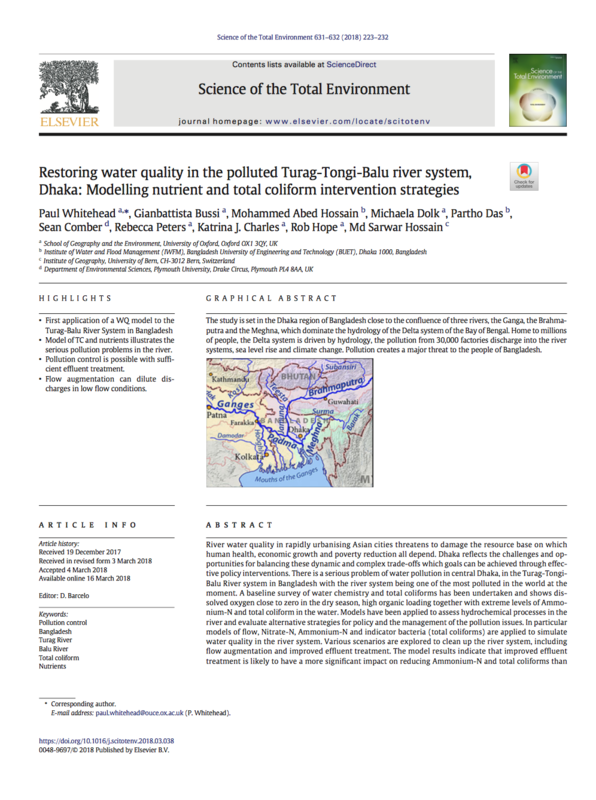 The model results indicate that improved effluent treatment is likely to have a more significant impact on reducing Ammonium-N and total coliforms than flow augmentation, but a combined strategy would greatly reduce the pollution problems in the Turag-Tongi-Balu River System. Click on the button below to access the open access paper on the Science of the Total Environment website.